In the past couple of years, three brands’ cordless drills have broken the 1,000 in. lbs. of torque barrier: Hilti, Makita, and Milwaukee. It’s not the first time these three heavyweights have clashed. They were also the first to break out full 7-1/4″ cordless circular saws. Given the popularity of cordless tools and their rapid performance increases, we separated these three to test the top tier of cordless drill power. These will also be featured next month in an update to our 18V Hammer Drill Shootout. We’re going to save the full quantitative data for the shootout, but here’s a look what we initially put these drills through. We used 2x pressure treated pine for our test material. First, we started with 1″ Bosch Daredevil Spade Bits in high speed mode. 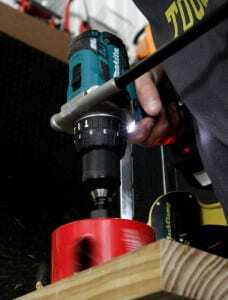 Nearly every 18V cordless drill on the market today should be able to handle this test. It’s a good indication of how smooth a drill operates under load. It’s also a good test to get an idea of how that high speed mode is geared. Since all of our drills were in the 2,000 – 2,100 RPM range, any strain in this test would expose that too much torque was sacrificed for it. Fortunately, all of our drills performed admirably. 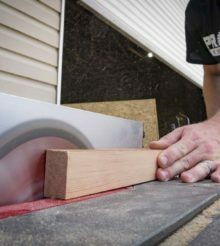 This test was followed by a 1-1/2″ spade bit in low speed. Well, in Hilti’s case, second to lowest speed. Again, this test gave us an idea of how smooth each drill would perform under load in a higher torque mode. There were no issues in getting each drill comfortably through this test. Between these two tests, Milwaukee’s M18 Fuel Hammer Drill delivered more vibration than the other two. We also noticed that Makita drilled slower under load, though we certainly wouldn’t classify it as slow performing. Hole saw tests were performed starting with 4-1/4″ wood boring hole saws. This was in the wheel house of Hilti’s SF 10W-A18, but actually exceeded the recommendations for Makita and Milwaukee’s 3″ capacity. This wasn’t easy for Hilti’s drill, but it powered through well. Even with smooth performance and excellent ergonomics, I wouldn’t want to be drilling these all day. Makita and Milwaukee struggled here. Both made it through, but I had to stop twice with Milwaukee’s 2704-22 and several more times with Makita’s XPH07T. We expected them to have some trouble though. It’s more an indication of gearing than pure power. 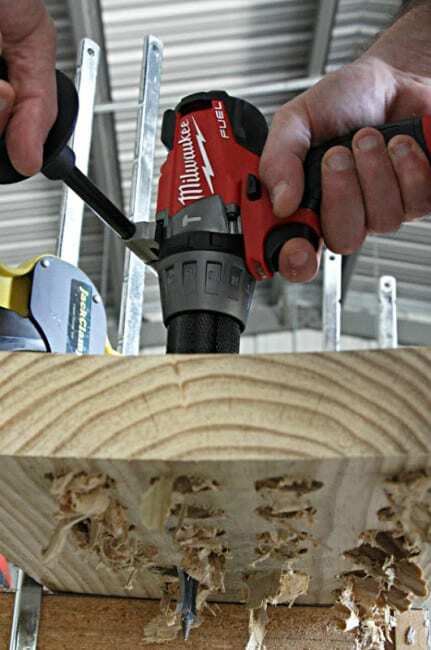 Hilti has simply optimized their drill for higher stress applications (whereas Milwaukee developed their Cordless M18 Super Hawg the handle these applications). The good news is that all of the drills seemed happy boring with a 3″ hole saw. We didn’t put Makita of Milwaukee to work on concrete yet. We’ll be bringing in some slabs to specifically test the hammer drilling capability of a host of models in the coming weeks. Until then, we hope you find these initial tests to be valuable in separating these three heavy hitters of the cordless drill world! Controlled power – that’s the feeling I’m left with when I set the Hilti SF 10W-A18 down for the day. Tackling high stress applications by transferring incredible power smoothly without tearing your arm out of socket is great. That’s not all there is. Where the drill really sets itself apart from other 1,000+ inch pound torque drills is in that 1st gear. The controlled ability to mix thinset or mortar without burning up the drill breaks through a barrier that’s existed for a long time. In addition, you also get 6″ hole saw capacity that bests the others significantly. Once again, Hilti delivers outstanding performance that simply places it on another level altogether. While it’s not the highest torque drill on the market anymore, the Makita XPH07T kit really stands out for the smoothness of the drilling and boring applications. Like we found in their compact miter saw, it’s a characteristic that is beginning to define our Makita experience. We really like that Makita kitted this unit with a pair of 5.0 amp hour batteries. The extra long handle is also really beneficial. Where some users may want to see the hammer drill improve is in weight. At 5.9 pounds, it is heavier than some of its competition. However, I’ll take the extra weight if it means I’d have to trade off some of the durability or smooth drilling. The Makita XPH07T comes across as a solid premium kit that’s definitely aimed at Pro users. Power is unquestionably great for the M18 Fuel as it leads the class. The way the power is channeled makes me want a third speed though. Perhaps dropping the RPM’s and bumping up the torque in mode 1 would lead to a higher hole saw rating. Then, the addition of a middle gear could balance out the two extremes. Build quality is outstanding as we expected. 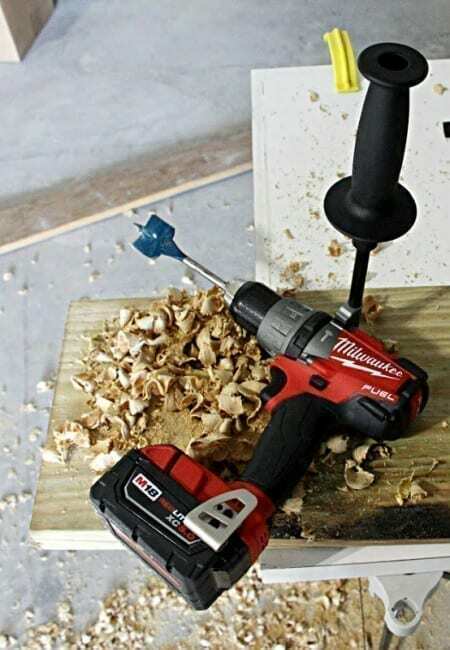 Ergonomics in the hand are excellent as well, but suffer a little bit under load because of the vibration that makes its way to your hand on the drill when it’s not in hammer drilling mode. 5.0 amp hour batteries take the run time to a level that’s nearly impractical to test using methods that fall under the most used applications. Let me know when you compare today’s “heavyweight” drill to the 36v Dewalt drill I’ve had for a decade. It mixes concrete/mortar, and does the hole saw thing handily. It’ll also break your wrist if your not careful. Sadly Dewalt never provided torque specs.